I’ve decided to kick off my second iteration of 50 Days to Dragon*Con by talking about some dragons that I have known. The How to Train Your Dragon dragons are just a recent obsession, one that burrowed into my mind because a) the Toothless dragon is pretty cute and b) the dragons in this movie are basically like giant cats. And who doesn’t want a giant adorable fire-breathing cat that you can love (and maybe even fly on? I originally had “who doesn’t want a giant adorable fire-breathing cat that you can ride and love, but that came off a little wrong). The movie even features little tiny dragons–little tiny pet dragons guys! How amazing would that be? Last Dragon*Con I stumbled upon a booth selling these little poseable dragons, and they had a black and red model with a face that looked like Toothless. So I totally bought it (duh). Cute right? Of course now it just sits, coiled up around my nightstand lamp. Dragon*Con impulse buys, what can you do right? 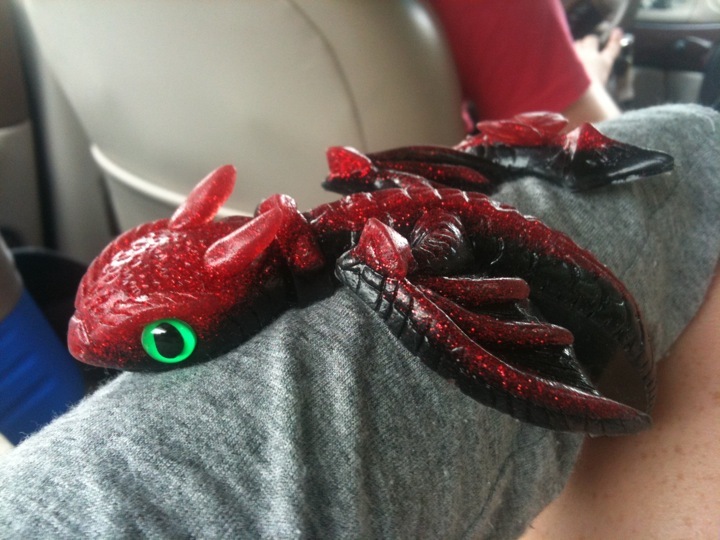 Bring your little guy back to Dragon*Con! Shoulder dragons are always popular accessories. As for impulse buys, I’ve done a few of those myself *looks at embarrassingly large corset collection*. But you’re right, what can you do except enjoy the little piece of D*C that you brought home!! Thanks for the comment! He doesn’t match any of my costumes so he’ll be staying him this year; also I’d be too preoccupied with worrying about damaging or losing him, so he’s safer on my nightstand. I’ve frequently been tempted to get a corset, but I have been un or underemployed for two of my three Dragon*Cons so I kept my spending limits SUPER low to pay for costumes/hotel etc. This year I am gainfully employed (with health insurance and retirement plan, huzzah adulthood!) so maybe I’ll splurge on something fancy. Like a corset! Although more likely I’ll be using the money to buy a new and better camera so I can enjoy the greatest Dragon*Con souvenir of all: amazing photographs! You are most welcome! If you do decide to go the corset-splurge route, I highly recommend Timeless Trends. They’re sooo reasonable and made very well. My favorite book as a child was Jeremy Thatcher Dragon Hatcher. I would love to see that made into a movie.